I am hanging out in Chicago with Peter Ferry, a high school English teacher and travel writer. Besides his hometown of Chicago, Peter has taken me along on his travels to Mexico, Thailand, and (my favorite) canoeing in the wilderness of Canada. This is an odd book - a novel where the author is the main character, blurring the line between memoir and fiction - but a very interesting book. I've been to Chicago a few times, but I'm wishing I knew it better so I could fully appreciate all the references to favorite restaurants, bars, and parks. The novel's action is interspersed with the main character's travel essays, so I'm enjoying those locations as well. It's Monday 9/28! What Are You Reading? My kids have the day off, so I slept in a bit this morning (Happy Yom Kippur to those who celebrate it!). I finished The Year of Living Biblically by A.J. Jacobs (you can read my review at the link) - it was an entertaining and edifying book. I read a teen/YA novel, Living Dead Girl by Elizabeth Scott. It is an absolutely chilling yet compelling book about a young girl who was abducted at age 10 and has been living with her captor for the past five years. I'll post a review of this haunting book at Great Books for Kids and Teens this week. I started a new novel, Travel Writing, by Peter Ferry that explores the thin line between memoir and fiction. I'm enjoying it very much so far - I always like books about writing and writers. In the books-to-movies category, my husband and I watched The Reader this weekend, and I thought it was an excellent film adaptation. I was pleased to see that the movie retained all of the complexities of the thought-provoking book. I also posted reviews of the teen novel Bounce and a wonderful fantasy trilogy for middle-grade and teen readers, The Cronus Chronicles, this week at Great Books for Kids and Teens. Thanks to That Chick That Reads for Quote It Saturday! That was one of the most important lessons I learned in the long educational process that I've come to call my life: although other people might create havoc for me, the more I seethe toward them, the more I make myself suffer. I try to remember this lesson myself - that anger and bitterness hurt me more than they hurt the object of my dissatisfaction. A.J. Jacobs’ second memoir, The Year of Living Biblically: One Man’s Humble Quest to Follow the Bible as Literally as Possible, is at turns funny, inspirational, and sometimes just plain silly. As the subtitle explains, the book chronicles his efforts to live according to the Bible’s many rules, not just the Ten Commandments but all edicts in the text of the Bible. I read this book for one of my book groups. To give you an idea of where Jacobs was starting from (and his sense of humor), he describes his own religious background as, “I am officially Jewish, but I’m Jewish in the same way the Olive Garden is an Italian restaurant. “ Despite his Jewish heritage, Jacobs goes into his biblical year with a very open mind, following both the Old and New Testaments and investigating the beliefs of a wide variety of religious groups (and I do mean a wide variety). So, now, I’m going to pray. Even though I’m not exactly sure how to pray. I’ve never prayed before in my life, not counting the few perfunctory uplifted gazes when my mom was sick. For starters, what do I do with my body? The Bible describes a multitude of positions: People kneel, sit, bow their heads, lift their eyes skyward, put their heads between their knees, raise up their hands, beat their breasts. There’s no single method. Sitting is tempting, but it seems too easy. I’m of the no-pain, no-gain mind-set. So I settle on holding my arms outstretched like a holy antenna, hoping to catch God’s signal. At other times, his attempts to follow the Bible are just plain silly and seem senseless, set up only to go for a laugh, like when, in an attempt to follow the Bible’s command to stone adulterers, he goes to Central Park and tosses tiny pebbles at people. For some people in my book group, this artificial set-up of the book was just too contrived – he admits in the introduction that he did this year-long experiment in part so he could write a book about it – but most others were entertained and educated by his experiences. My alter ego’s behavior points to one of the biggest mysteries of the Bible. How can these ethically advanced rules and these bizarre decrees be found in the same book? And not just the same book. Sometimes the same page. The prohibition against mixing wool and linen comes right after the command to love your neighbor. It’s not like the Bible has a section called “And Now for Some Crazy Laws.” They’re all jumbled up like a chopped salad. Admittedly, I know very little about the Bible myself (those few Sunday school classes were a looong time ago), though I do try to be a spiritual person. I learned a lot both about the Bible and about the beliefs of various groups that he met with during his year, and I also enjoyed Jacob’s humorous writing style. You might be familiar with Jacobs from his first memoir, The Know-It-All, in which he read the entire Encyclopedia Britannica in a year (see a pattern?). Overall, I enjoyed the book, and I’m glad I read it. I am in Louisiana and loving it, accompanying the sweet Calla Lily Ponder who grew up in La Luna, a small rural town along the La Luna River, and is currently residing in New Orleans (which happens to be my favorite place on earth). It’s Monday 9/21! What Are You Reading? I finished The Immortal Fire, book three of the middle-grade trilogy The Cronus Chronicles by Anne Ursu. I loved the whole series and will post a review on Great Books for Kids and Teens this week. I’m now reading The Year of Living Biblically: One Man’s Humble Quest to Follow the Bible As Literally As Possible by A.J. Jacobs for one of my book groups. I’m enjoying both its humor and spirituality, though it does occasionally veer into the realm of silliness. I’ll review it here after my book group meeting Wednesday. I’m still listening to the audio book The Crowning Glory of Calla Lily Ponder by Rebecca Wells and still LOVING it! I can tell this is going to be one of my favorites. I also enjoyed a trip to the bookstore last week to buy gifts for several people. I've been trying not to spend too much on books for myself (especially with an overflowing to-be-read stack! ), but I couldn't resist a reduced-price copy of Olive Kitteridge for an upcoming book group for myself. Last week, I posted reviews of The People of the Book here and of The Book of Ember series at Great Books for Kids and Teens. I also posted two Top Ten lists: Best Book Group Books and my son’s list of Best Fantasy Series. (What are you reading Monday is sponsored by J. Kaye's Book Blog). The secret of life, though, is to fall seven and to get up eight times. No matter what he does, every person on earth plays a role in the history of the world. And normally, he doesn’t know it. I find the first quote especially inspirational - it's a reminder that it's OK if you fail or things don't go right. It's just a part of life and you keep getting up. Thanks to That Chick That Reads for starting Quote It Saturday! Stop by her blog to check oput her quote for this week. One of the best books I’ve read all year, The People of the Book by Geraldine Brooks is a fascinating historical fiction based on the true story of a unique Hebrew book that has survived centuries. The Sarajevo Haggadah, as it’s known, resurfaced in 2001 after many assumed it had been lost in the looting and shelling of the recent Bosnian war. This wasn’t the first time this book beat the odds – it also survived the burning of Jewish books by the Nazis during World War II and the Spanish Inquisition, among other violent historical events. Brooks takes the facts of the Sarajevo Haggadah – which are, in and of themselves, a fascinating story – and fills in the missing pieces with a cast of remarkable characters and a bit of imagination. I slipped the scalpel under the thread, and the codex eased apart into its precious folios. I lifted the first one. A tiny speck of something fluttered from its binding. Carefully, with a sable brush, I moved it onto a slide and passed it under the microscope. Eureka. It was a tiny fragment of insect wing, translucent, veined. We live in a world of arthropods, and maybe the wing came from a common insect and wouldn‘t tell us anything. But maybe it was a rarity, with a limited geographic range. Or maybe it was from a species now extinct. Either would add knowledge to the history of the book. I placed it in a glassine envelope and labeled it with a note of its position. Hannah’s work is like CSI for book lovers. While she’s painstakingly caring for the book, she’s also using clues like the insect wing to piece together parts of its history. She consults with various experts to analyze those clues; her work is fascinating. In addition, we get to know Hannah as a person – someone with mother issues and friends and a fair amount of loneliness. Interwoven with Hannah’s story in the present day are the stories of various parts of the book’s history – how those clues came to be in the Haggadah. So, throughout the book, we meet the young Jewish woman and Muslim man who saved the book from the Nazis, the Catholic priest who approved the book and saved it from the pope’s Inquisition in the 1600’s, and even the artist who created the book. It’s a unique and imaginative construct that makes a captivating real-life story even more intriguing. Brook’s writing is, as always, beautiful and moving. She makes you care about the characters and the Haggadah. I loved March, her historical novel about the father from Little Women during the Civil War, and People of the Book lived up to my high expectations. This is also a wonderful book for book clubs. In my neighborhood book group, everyone enjoyed the novel, and it inspired some wonderful discussions on a wide variety of topics. Not usually, though I like to have a cup of herbal tea or decaf mint green tea. Can't bring myself to write in non-textbooks. Post-It Page Markers do the trick! Ends of chapters...and then often onto the next chapter - so hard to put a good book down! I know I should but... Again, Post-It Page Markers are awesome for this! The Year of Living Biblically by A.J. Jacobs for a book group. Trying not to spend money but succumbed today and bought Olive Kitteridge while shopping for birthday gifts. Can only read one at a time, but often have an audio book going at the same time. In bed, before naptime (medically necessary) and bedtime. Also on sick days. ha ha ha...that's a good one. We have books stacked all over the house, and all the bookcases are full! I currently belong to two book groups and used to go to two others that have now disbanded. The books on this week’s list are ones that were not only enjoyed by most, if not all, group members but that generated great discussions, too. I tried to skip over the obvious choices – everyone knows that The Kite Runner and To Kill A Mockingbird are great for book groups – to include some that you may not have read yet. So, I have another book group discussion next week and can use some more good ideas – what books do you recommend for book groups? P.S. If you like Top Ten lists, check out my son's new list of Top Ten Fantasy Series at Great Books for Kids and Teens. It's Monday, 9/14! What Are you Reading? Whew, it's late afternoon already. Crazy-busy Monday morning, getting the kids off to school and myself to New Jersey for a doctor's appointment. The good side of the long drive? Audio books, of course! I finished The Siren Song by Anne Ursu, book two of a wonderful middle-grade series about two modern kids battling real-life Greek gods. I'm just about finished with the final book of the trilogy, The Immortal Fire, and I didn't want to put it down to write this post! I'm listening to the audio book The Crowning Glory of Calla Lily Ponder by Rebecca Wells, author of the Ya-Ya Sisterhood books. Her latest novel is heartwarming and fabulous, set in one of my favorite places on earth, Louisiana, and the narrator is perfect. I've gotten a bit behind with reviews because I was very sick for the past two weeks, but hopefully this week will be better. 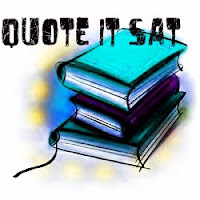 Look for reviews both here and at Great Books for Kids and Teens and check out my new feature, Quote It Saturday. Life sometimes gets so bogged down in the details, you forget you are living it. There is always another appointment to be met, another bill to pay, another symptom presenting, another uneventful day to be notched onto the wooden wall. We have synchronized our watches, studied our calendars, existed in minutes, and completely forgotten to step back and see what we've accomplished. This quote really hit home with me. I should probably read it once a week to remind myself to see the big picture. It's so easy to get bogged down in the mundane details of every day. I chose to read In My Heart by Ursula Hanks because this memoir seemed to mirror some of what my husband and I are going through right now. Hanks writes about taking care of her aging parents, as her mother deteriorates quickly with Alzheimer’s to the point that her 88-year old father can no longer take care of her by himself. They live with Hanks and her husband for awhile until her mother needs to go into a care home. This story parallels our own to some degree. My husband’s parents are also in their 80’s, and we’ve watched his mom deteriorate with Parkinson’s disease. My father-in-law was taking care of her by himself in their home (we live 2000 miles away) until last year, when she fell and broke her hip and could no longer stand. She’s in a nursing home now. Hanks perfectly describes the tumultuous feelings associated with all of these changes. She writes about her own dismay at her mother’s downward spiral, her desire to want to take care of her parents, and the difficulty of becoming a caregiver to the people who used to take care of you. She also describes her father’s deep love for her mother and desire to take care of her, as well as his frustration and sadness as she gets worse. Maybe because our family had visited Mom and Dad so frequently, we didn’t really notice the decline in Mom’s ability to do the things she had always done so effortlessly. When she talked about losing something and not being able to remember things, we chalked it up to normal old age symptoms and reassured her that even younger people forget things also. To restore her confidence, I even told Mom the joke that “you don’t have Alzheimer’s until you forget what you forgot.” Later my heart sank when I realized how lightly I had spoken about such a grave subject. I wondered why I had not paid more attention to the signs, especially since I knew that getting older is the greatest risk factor for Alzheimer’s, with one in ten individuals over sixty-five and nearly half over eighty-five affected. Reading about statistics and actually experiencing the reality were somehow a million miles apart. In between recounting recent events with her parents moving in, Hanks also tells about her family’s history: her parents’ youth in Germany before and during World War II, her own childhood first in Germany and then in the U.S., and her first difficult marriage and experiences parenting her children. Her stories are engaging and help to make her family seem like old friends to readers. The writing isn’t as polished as other memoirs I’ve read, but her story is powerful and honest, told with warmth and love. I recommend this book to anyone struggling with issues of aging parents. It's Monday 8/7! What Are You Reading? I finished People of the Book by Geraldine Brooks for my book group. I loved this book - it was the fascinating story of an ancient Hebrew book that survived centuries and was filled with interesting characters. I know several of you are waiting for the review, but I'm going to wait to post it until after our book group meeting on Wednesday so I can include the impressions of the whole group. For my first short selection, I read a memoir, In My Heart, by Ursula Hanks. Hanks tells the story of taking care of her declining parents, with flashbacks to their (and her) earlier life. This book really touched me. Next, I chose a (short) teen novel, Bounce by Natasha Friend. This was also very good, telling the story of how 13-year old Evyn tries to adjust to her instant new family when her Dad remarries. Now I'm reading The Siren Song, the second book in the middle-grade series The Chronus Chronicles by Anne Ursu. My son and I both loved Ursu's first book, The Shadow Thieves, about how two ordinary kids battle with real Greek Gods to try to save the world. When I finish this one, I'll read the final book in the series, The Immortal Fire. I love Ursu's witty, clever writing and suspenseful plots. Last week, I posted a review of On the Road, the 1950's road trip classic, as well as my own Top Ten List of Books That Taught Me Something. Stop by and tell me about your favorite enlightening books! With the hectic start of school last week, I got a bit behind on my other book blog, Great Books for Kids and Teens, but look for new reviews this week. 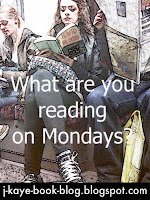 (What are you reading Mondays is sponsored by J. Kaye's Book Blog). My family loves our road trips. Every summer, we take long road trips from the East Coast to Oklahoma or South Dakota to visit family, making stops along the way, seeking out cool roadside diners, and enjoying the freedom of the road. I’d heard that On the Road by Jack Kerouac was the quintessential road trip novel, so I started it during a shorter trip to New York State two weeks ago. The novel, which was autobiographical, centers on budding writer Sal Paradise (based on Kerouac) and his friend, Dean Moriarty, who take various cross-country trips, exploring America. In between trips, Sal lives a somewhat normal life, writing (and publishing) a novel and living with his aunt in New York City. Dean is a wild younger man who grew up partly in reform school and who strives to live life to its fullest. This exciting philosophy draws Sal in and entices him to follow Dean cross country. “Oh, man! man! man!” moaned Dean. “And it’s not even the beginning of it – and now here we are at last going east together, we’ve never gone east together, Sal, think of it, we’ll dig Denver together and see what everybody’s doing although that matters little to us, the point being that we know what IT is and we know TIME and we know that everything is really FINE.” Then he whispered, catching my sleeve, sweating, “Now you just dig them in front. They have worries, they’re counting the miles, they’re thinking about where to sleep tonight, how much money for gas, the weather, how they’ll get there – and all the time they’ll get there anyway, you see. But they need to worry and betray time with urgencies false and otherwise, purely anxious and whiny, their souls really won’t be at peace unless they can latch onto an established and proven worry and having once found it they assume facial expressions to fit and go with it, which is, you see, unhappiness, and all the time it all flies by them and they know it and that too worries them no end. As you can see, On the Road features a unique writing style. First published in 1955, the novel has been said to define the beat generation, and, apparently, Dean became something of a cult figure. Kerouac’s writing varies between vivid descriptions of the towns and cities and scenery they travel through and rambling dialogue, like what I’ve quoted above. There are also long descriptions of jazz or “bop” as they refer to it, as they go to all-night jazz clubs in New York and San Francisco. This was certainly different from any novel I’ve ever read before. The road trips – filled with hitchhiking, partying, and all-night driving – were quite different from the family road trips we take every year, but I still enjoyed the idea of traveling and exploring the country that the novel illustrates. I also enjoyed reading about the time period – set in the late 40’s – ands especially details of the cars, the towns, and the prices. I’m glad I read this classic. With school back in session, I have a little more time to write, so I wanted to get back to my Ten for Tuesdays feature, with my Top Ten Books That Taught Me Something. How about you? What books have taught you, inspired you, and changed your perceptions?